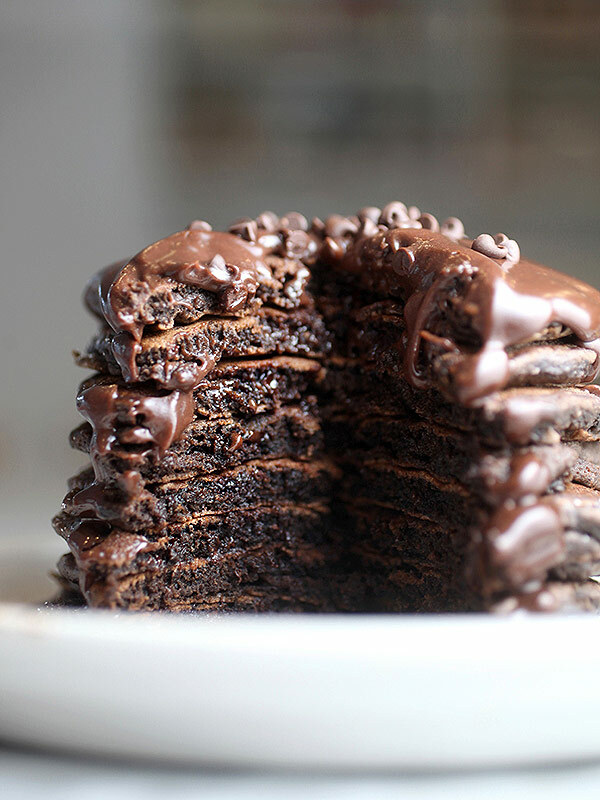 These chocolate pancakes are perfect to indulge in on a special Saturday morning. 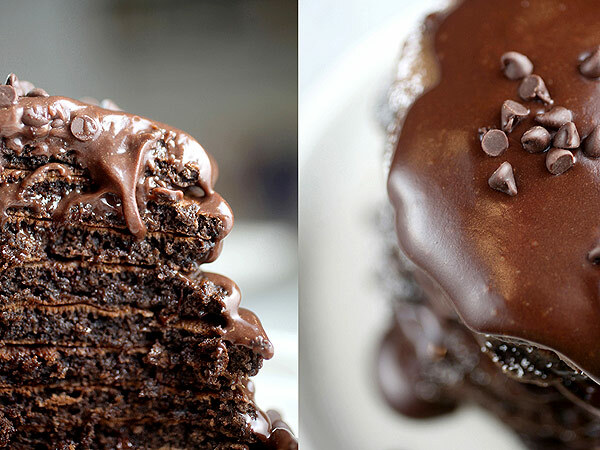 Filled and covered with chocolate, they are more like dessert than breakfast. Angie Dudley, a.k.a Bakerella, is the author of the New York Times best-selling book Cake Pops and creator of Bakerella.com. 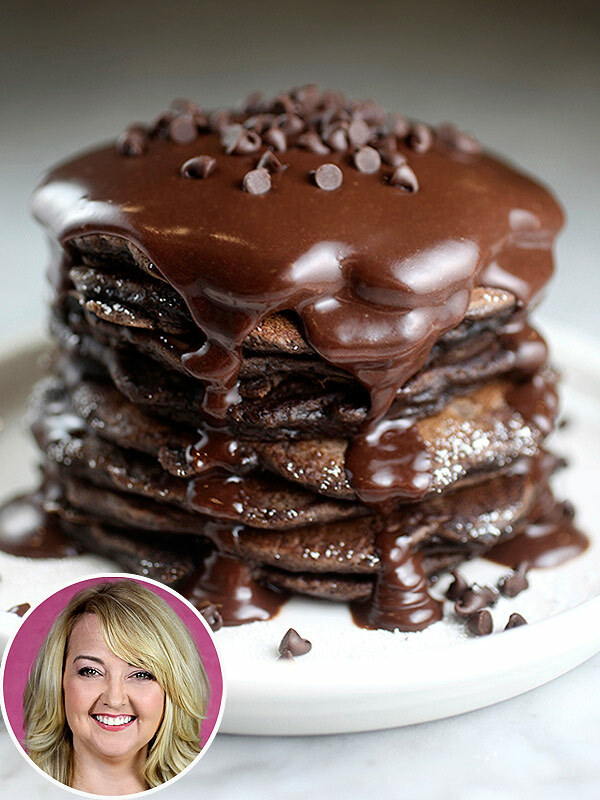 Visit PEOPLE.com on Fridays for her sweet spin on celebrity recipes and more. But, if you want to be a little more healthy, skip the chocolate sauce and serve them with berries and yogurt like in this [premium title=”Chocolate Waffles” url=”https://www.people.com/people/premium/celebfood/recipe/0,,20711924,00.html”] recipe from Patti LaBelle. Still delicious, but a bit less decadent! 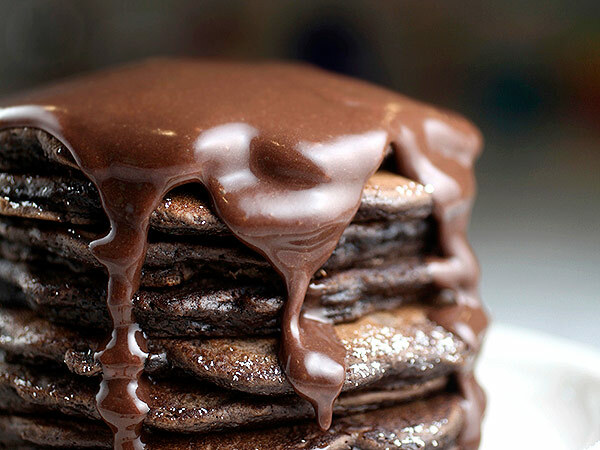 For the enticing effect pictured here, stack up a few pancakes and cover the top completely with chocolate sauce so it slowly drips down the side of the pancake mountain. Then sprinkle with a few extra chocolate morsels on top and dive in! 1. In a medium bowl, whisk dry ingredients together. Add wet ingredients and whisk until combined. The batter will be lumpy. Stir in miniature chocolate morsels. 2. Heat griddle over medium heat and lightly grease surface with butter. 3. Use a ¼-cup measuring cup to scoop batter onto griddle to ensure similar size pancakes. Cook until pancakes have bubbles on the top, then flip them over and cook for an additional minute. Repeat with the remaining batter. 4. Serve warm with powdered sugar.